2. Look for the link stating for the result. 3. Click on it and enter the asked details. 4. After clicking on the submit button, the result will appear on the screen. 5. Download and save the scores which you store and take a print out for future use. 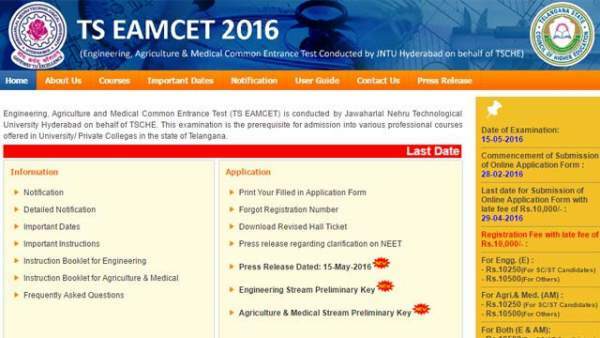 This year, more than 2.46,000 students appeared in the Telangana EAMCET 2016 examination held earlier in 2016. Out of the total 2,46,522 applicants, 1,44,540 registered for engineering while 1,02,212 for agriculture and medical streams. The exam took place on 15th May. It was of 3-hour duration starting from 10 am to 1 pm for engineering (E) stream, and then, it was the term for agriculture and medical (AM) stream from 2:30 pm to 5:30 pm. In Hyderabad zone, a total of 94,402 applicants applied for the exam. Out of which 61,637 candidates were for engineering purposes and 32,765 applicants applied for agriculture and medical exam. This exam is carried out by the Jawaharlal Nehru Technological Universtiy (JNTU), Hyderabad on behalf of TSCHE. JNTUH is situated in the state capital and heart, Hyderabad. Its responsibilities include sparking the knowledge among students, generating inside confidence, and the strength to face the world. It provides and tries to provide better education. Telangana State Council of Higher Education has given the task of conducting this examination. All the best to all the candidates. Stay tuned for more news. Next articleSaath Nibhana Saathiya Spoiler Alert – Gopi to commit suicide ?